Have been in cupboard for years and never used. Vintage crystal flute wine glasses iridescent blue - a pair. Genuine Swarovski Crystal Sealife Sam The Fish. Great Condition, Stunning blue fish Also selling sea life lovlots Shelly the fish & Gina the seahorse. Genuine Swarovski Swan Logo At Bottom Of Each Crystal, please see attached pictures. These Crystals were given to me as a presents about 2 years ago or so, so unfortunately it comes without box, will be wrapped up well in extra bubble wrap and well package. I absolutely love my little collection, however I am in need of the money at the moment, so really need to sell them... Selling other Swarovski crystals, please have a look. Caithness Glass Scotland. Etched in base" Caithness Scotland Cornflower" "T70812". Entitled : Cornflower. Round shaped Glass Paperweight. Designer Helen MacDonald. Colour - Blue. Etched in base" Caithness Scotland Festive Snowman" "Helen Macdonald" Z71327". Caithness Glass Scotland. Round shaped Glass Paperweight. Designer Helen MacDonald with signature to base. Entitled : Festive Snowman. Bristol Blue Glass bird duck design rare 8 x4 cm Signed From Bristol Blue Crystal Glassworks. Signed With some initials & BRISTOL. Condition is used but it has only sat in a display cabinet. I do not have the original box but it will be well packed for posting. Please look carefully at the photos as they form part of the description. I am selling some other Bristol Blue items and I am happy to combine postage on items paid for together. Please ask any questions before bidding. Dispatched with My Hermes. M136 WHITEFRIARS TEXTURED LEAD CRYSTAL FRUIT/DESSERT BOWLS x5. Dispatched with Royal Mail 2nd Class. Consistent quality to all five bowls in a lovely light blue/clear colour. No evidence of damage (see photos). Stored in a damp free cupboard since purchase. Stands 3 cm tall 2.5 cm wide. New listingPair of large controlled bubble studio Glass Apple & Pear Paperweights. Pair of large controlled bubble studio Glass Apple & Pear Paperweights. Apple is in excellent condition with no flaws and is in a really lovely blue glass. The clear glass Pear has a slight flaw to the stalk but it isn't noticible. DIMENSIONS APPLE 18cm circumference x 8cm high. PEAR 8cm x 10cm Condition is Used. I am selling off my glass collection so please look at my other items. I will happily combine postage. You are looking at a Swarovski Crystal dice with blue spots. DESIGN NUMBER 9655. 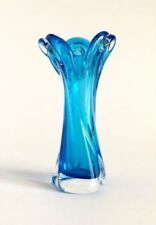 KINGFISHER BLUE TAPERED GLASS VASE. LOW STARTING PRICE. WHY SO LOW BECAUSE I'AM NO EXPERT AND BELIEVE IT WILL REACH THE RIGHT PRICE. You are looking at a Swarovski Crystal blue tulip. Size 11.5x3.5cm approx plus thread for hanging. 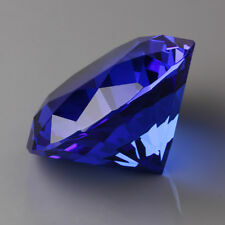 Stunning in blue, this Engraved Crystal Paperweight really will catch your eye. The front of the crystal is engraved with3 lines of text, 10 characters on the 1st line, 15 on the second and third and 10 characters on the last line. 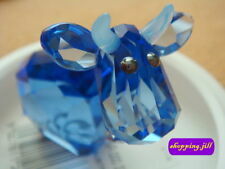 SWAROVSKI CRYSTAL DISNEY EEYORE (COLOUR)1142842(RETIRED/RARE). Dispatched with Royal Mail 1st class signed for and insured. This comes from a smoke free home,and has been in a glass case. Handmade glass paperweight made by myself (Jay Jordan) at Station glass studio based in Leicestershire, England. Made with silver blue fused together with enamel white chip and twisted by hand to give it the swirls and almost wave effects in the glass. All of the glass I have made are one of a kind and as a hand made item there’s not one alike anywhere with all the little bits of character inside that are unique to each piece. And I hope buyers will enjoy them as much as I had making them in this amazing Job. You are looking at a Swarovski Crystal blue heart. Handmade flowers, made from colored lead crystal glass, look very brittle. Surprisingly, they are not. Crystal flowers are created from highest quality colored crystal glass by artists, one after another. Bristol Blue Glass swan rare 9 cm Signed From Bristol Blue Crystal Glassworks. Signed S Baker CBG BRISTOL. Condition is used but it has only sat in a display cabinet. I do not have the original box but it will be well packed for posting. Please look carefully at the photos as they form part of the description. I am selling some other Bristol Blue items and I am happy to combine postage on items paid for together. Please ask any questions before bidding. Dispatched with My Hermes. Murano Glass MANDRUZZATO Facet Crystal 21cm Blue , Yellow and uranium which glow fantastic green colour a really beautiful piece of glass making history a must for any collector. Sommerso 1960´s VASE. In a lovely condition. Vintage Retro Glass Duck Murano Miniature Figurine. Dispatched with Royal Mail 2nd Class. Material: K9 Crystal. Color: As Picture Shows. EDINBURGH CRYSTAL ETCHED BLUE MARINE LIMITED EDITION ! IN BOX IMMACULATE. 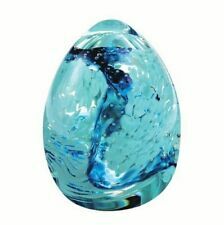 Blue Bubble Glass Sphere Paperweight. rubbing to decoration, small scratches and marks to the surface. Natural wear and tear, utensil scratches, gilt wear, stilt marks, light natural crazing and firing faults. 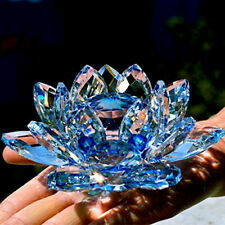 SWAROVSKI Crystal SCS Members Blue Flower Paperweight. Dispatched with Royal Mail Signed For® 2nd Class. RCR ROYAL CRYSTAL ROCK ITALY GLASS SWANS BLUE BASE BIRD FIGURINE ORNAMENT. Dispatched with Royal Mail 2nd Class. 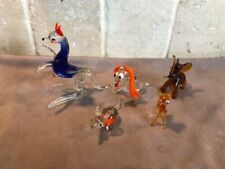 From Selkirk Glass, Miniature Masterpieces?. Each paperweight is handmade, therefore a unique work of art. This is a beautifully balanced, eye catching example. Appears to be the 'Star Fountain' design from the 1999 catalogue, in blue. From Selkirk Glass. The artist is also unattributed but would be one of the few exceptionally talented Selkirk team. Blue and Copper Abstract Paperweight with a floral or possibly aquatic design. It has a Swarovski Souvenir sticker on the black flocked base, it looks stunning?. A photo is also shown of the 60mm and 50mm for comparison. The 60mm is the left paperweight. NEW Mats Jonassen Swedish blue flower small paperweight.